The Washoe County District Attorney’s Office is paying tribute to former District Attorney and longtime Nevada Icon, the late Senator William Raggio. 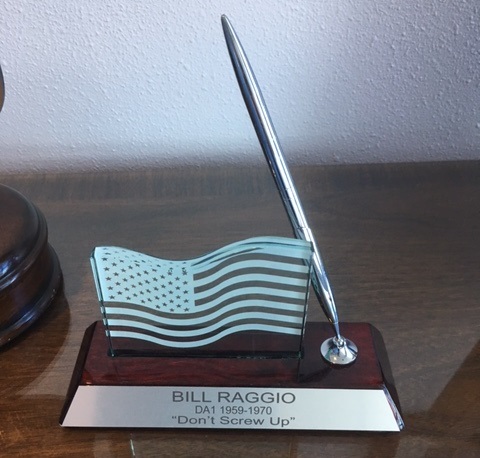 Thanks to a generous donation by Raggio’s widow, Dale Raggio, a memorial has been established in the executive floor of the District Attorney’s Office located in the Mills Lane Justice Center. This memorial is the newest effort by the office to recognize and preserve its proud 152 year history of public safety service. 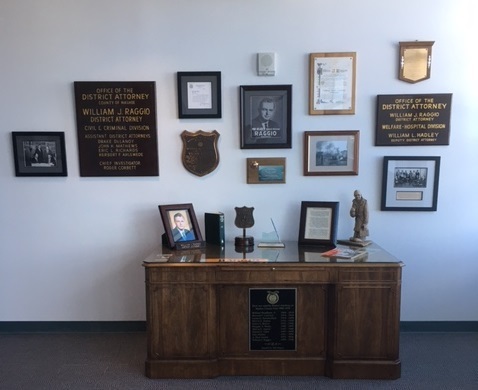 The desk used by District Attorney Raggio serves as a centerpiece to the memorial that consists of donated books, badges, office memorabilia and personal effects once belonging to the well-known prosecutor and Nevada State Senator. The addition of the Raggio memorial builds on previous efforts to capture the Office’s past through photos and other documents already on display. William T. Raggio began his service to Nevada in 1952. He served 38 years in the Nevada Legislature and 18 years as a prosecutor for the Washoe County District Attorney’s Office, including 12 as its elected District Attorney. His influence in Nevada and as one of the District Attorney’s Office’s most respected lawman was detailed in a 2011 biography titled, “A Man of His Word.” During his tenure as DA, Raggio tried many well-known capital and corruption cases. His longtime feud with Joe Conforte during the 1950s ended with the infamous brothel owner’s conviction on extortion charges. 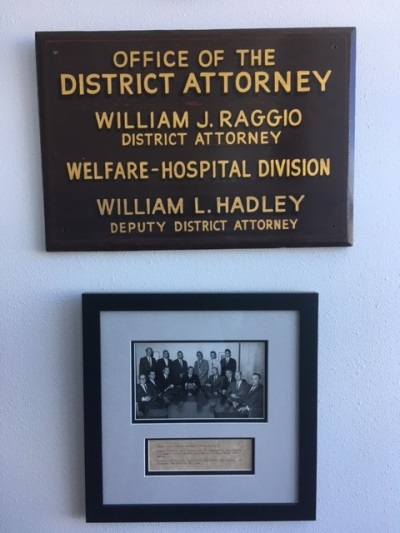 In addition, Raggio professionalized the DAs office through modernization and the creation of innovative programs and practices that are still in effect today. He was a founder of the Nevada District Attorney’s Association, was nationally recognized in 1964 as the “Outstanding Prosecutor” of the year, and went on to become Nevada’s longest serving state senator.